How to make perfect fried chicken. With summer's fast approach, many of us reminisce about summers past. The sounds of summer -- the droning of a lawn mower, the distant slamming of a screen door -- can sometimes transport us back to childhood, however briefly. And for many people, particularly those with southern roots, fried chicken can be equally evocative. For me, it brings back Sunday dinners. Surely we didn't have fried chicken every Sunday but, in retrospect, it seems as if we did. So, with summer coming on and a little of the hysteria associated with fat and fried foods subsiding, it's a good time to revisit fried chicken. Whether you make it the main course of your Sunday (or any other day) dinner served up with cream gravy and hot biscuits, or take it on a picnic, served cold and complemented with potato salad, fried chicken is a joy for chicken lovers anywhere. You will probably want to make it the way your mama made hers, so we've included several different methods, one of which will probably come pretty close or hit the nail on the head. There are a number of points that are crucial to the success of your fried chicken. If the supermarket or butcher didn't already do it, cut the tips off the chicken wings at the last joint. No one eats them, and the pieces will fit better in your skillet. If you are frying a whole chicken or a selection of your favorite parts, use a big (at least 12 inch) skillet. It's okay for the pieces to touch, but they shouldn't be crowded. Use a heavy skillet. 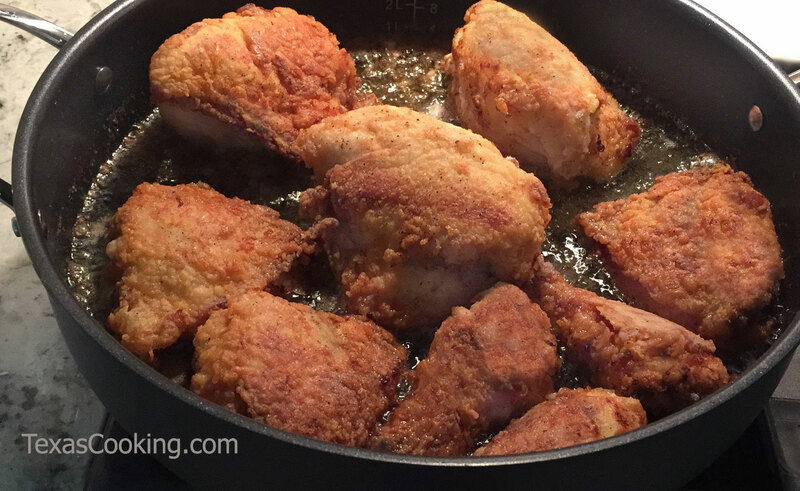 My personal preference and recommendation is cast-iron, but perfectly delicious fried chicken can be turned out of a heavy stainless steel skillet. Melted shortening (i.e., Crisco) really is better than cooking oil. It is extremely important that the melted shortening is the right temperature before adding the chicken. It should be hot, but not smoking, ideally 355°F to 360°F. Too low a temperature will result in greasy chicken. The shortening in your skillet should be 1/2 to 3/4 inches deep. We're talking fried chicken here, not deep fried. One and one-half cups of Crisco is just about right in my 12-inch cast-iron skillet. Your own personal preference will determine how you prepare your fried chicken. Our recipes, with variations, are for Grandma's Fried Chicken, Buttermilk Fried Chicken, Crispy Fried Chicken, and Spicy Fried Chicken. We have also included a recipe for Cream Gravy. Put your flour and spices in a roomy, strong paper bag. Drop the chicken pieces, a few at a time, into the bag, close it and give it a shake, coating the pieces evenly. Advantages: Makes less of a mess, does a good job. Put your flour and spices in a shallow dish or baking pan. Coat the chicken pieces by rolling them in the flour mixture. Advantages: You can see what you're doing; also does a good job. Whatever makes sense to you. Each of our recipes calls for 3 pounds of chicken. If, after trimming excess skin, you are working with substantially more than 3 pounds, adjust your ingredients and cooking times proportionately. If you elect to remove all the skin from your chicken, or use boneless, skinless chicken, cooking times will be reduced. This is your basic, delicious fried chicken. When the melted shortening reaches a temperature of 360°F on a frying thermometer (or test it with a small piece of chicken -- it should sizzle madly), carefully add the chicken pieces, skin side down, starting with the dark meat in the center of the skillet. Reduce the heat to medium-high, and fry chicken until skin side is golden brown, then turn and brown the other side. Reduce heat to medium, and cover the pan. Cook for 25 minutes, and remove the cover. Cook, uncovered, for 5 minutes. Remove the chicken pieces, and drain on paper towels. A buttermilk marinade will result in tender, juicy chicken. You can choose to heat up your fried chicken or not, depending upon your preference, with the variations. At least 3 hours (and up to 12 hours) before frying your chicken, combine the buttermilk with half the salt and pepper. Pour mixture over chicken pieces, turn all pieces to coat well, and refrigerate. Melt the shortening in a heavy skillet over high heat. While the shortening is melting, mix the flour and other half of the salt and pepper. Drain marinade from chicken pieces. Using either the paper bag or shallow dish method, coat the chicken pieces in the flour mixture, shake off the excess, and place in a single layer on a sheet of waxed paper. When the melted shortening reaches a temperature of 360°F on a frying thermometer, carefully add the chicken pieces, skin side down, starting with the dark meat in the center of the skillet. Reduce the heat to medium-high, and cover loosely. Cook for 15 minutes or until chicken is dark golden. Lower heat to medium and remove cover. Turn the pieces over carefully and cook, uncovered, for another 15 minutes. Remove chicken pieces, and drain on paper towels. Variations: Add 1 teaspoon tabasco or your favorite hot sauce to the buttermilk marinade; OR 1 or 2 pickled jalapeños with a few tablespoons of their juice. If you have paid attention to the foregoing recipes, you will have noticed two different frying methods. With the first recipe, you brown the chicken on both sides before covering and cooking it, uncovering it only in the last 5 minutes. With the second, you brown and cook the first side, then turn the chicken and brown and cook the second side. I have used each of these methods with equal success; however, I must point out that I usually opt for the former, since that is the way my Mama did it. Now, using either frying method or either flouring method, you can create Crispy Fried Chicken and Spicy Fried Chicken. Combine the flour, salt, pepper and cayenne pepper. Set aside. Combine the egg and milk in a separate dish. Set aside. Rinse the chicken pieces and drain. Working with one or two pieces at a time, flour the chicken, shaking to remove excess, then coat with the milk/egg mixture, then dredge again in the flour mixture, coating well. Place pieces in a single layer on a piece of waxed paper until all are coated. Add to skillet and cook using either frying method. The difference between Spicy Fried Chicken and Crispy Fried Chicken is in the spices used. Note that the cayenne pepper is omitted. You can experiment to create your own favorite spice blend. Prepare and fry chicken as for Crispy Fried Chicken. It is not mandatory that you make Cream Gravy every time you fry chicken, but it really completes a meal. It's so good on mashed potatoes, rice and biscuits, and I've even seen enthusiastic cream gravy lovers ladle it over fresh sliced tomatoes and cantaloupe. Honest. Actually, once the chicken is fried, you've done half the work, so it's not that much more trouble to go ahead and make Cream Gravy. After frying the chicken, drain the grease from the skillet, leaving in the crusted and browned bits, and reserving 2 tablespoons of the drippings. Return the 2 tablespoons of drippings to the skillet, and turn heat to medium. Sprinkle 2 tablespoons of the left-over flour mixture that you used to flour the chicken into the drippings, and stir vigorously for about 2 to 3 minutes to "cook" the flour. Then, stirring constantly, slowly add 1-1/2 cups milk (OR 1 cup milk and 1/2 cup beef broth), and bring to a boil. Cook, stirring constantly, for 2 to 3 minutes until gravy thickens. (If it gets too thick, thin it with a little milk.) Taste and correct seasonings, if necessary. Serve hot. It may be that "perfect" fried chicken is the kind you ate when you were just a spring chicken yourself. In case you would like to create some wonderful present-day memories, however, this article has equipped you for the task.